Longtime photographers will likely know the pain of seeing specks of dust inside an expensive lens. It can be frustrating, surely, but as Roger Cicala points out in a new blog post, dust is very unlikely to affect image quality. However, Lensrentals recently had a Canon 70-200mm f/2.8 IS II lens (a weather-sealed lens, no less) return from a rental not with dust, but rather, with a fly inside. If dust doesn't impact image quality, will a fly? As you might expect, removing a fly from a lens is a tricky task. As Cicala remarks, "If there’s going to be a fly in the lens, it’s going to be way deep inside where it’s really hard to get to. I don’t know why flies do that, but I promise you they do. You never see a fly just under the front or rear element. They get into the deepest groups, leaving little fly parts all over, and usually, get smushed by the zoom or focus element." As it happens, Lensrentals has already published a teardown of the Canon 70-200mm f/2.8 IS II lens, which you can see here. After removing components of the barrel and detaching numerous soldered wires, the lens finally starts to come apart. However, it's a very involved process to remove various lens elements and of course, the fly was deep in the lens, so there was a lot to remove. After all this deconstruction, the Lensrentals team still had yet to reach the fly. Image credit: Lensrentals, 2019. Flies may be an important part of a healthy ecosystem, but they are nonetheless unwelcome guests inside of a lens. This particular offender left hair and other parts of its body scattered across lens elements. At least it wasn't a spider that worked its way into the lens; they "spin a web in there. Every time." Once the Lensrentals team deconstructed the lens and were able to get to the fly, they determined the cause of death was squishing by moving glass. With the corpse and related gunk removed, the lens was reassembled and as good as new. The entire process took nearly four hours with an estimated cost of $369. You can see the full breakdown of time and cost components by clicking here. Bringing the discussion back to dust inside lenses, the Lensrentals team tested the 70-200mm lens, with fly inside, to see how the image quality was affected by the unwelcome guest. As it turns out, the effect was minimal and totally unnoticed until the lens was stopped down to f/13. It wasn't until f/22 that the fly went from manifesting as a slight shadow to being a serious problem. You can see the test shot by clicking here. 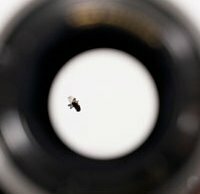 If a large fly has this small of an impact on image quality and overall lens performance, imagine what a significantly smaller bit of dust will do? "If your dust speck is smaller than a fly (about 4mm by 1.5mm) it's not showing up in your images," writes Cicala. This, and the time and cost associated with disassembling, cleaning and reassembling a lens is why Lensrentals won't clean the dust out your lens for something like $50. For a full breakdown of the fascinating fly incident, head to Lensrentals. You can see more blog posts by clicking here.